Building a better prosthetic heart valve? Using bio-remediation process to clean a toxic site? Developing high-performance polymers based on spider silk? All of these processes involve bioengineering: that is, they apply biological knowledge and principles in the design of structures, materials, devices and processes. McGill University recently approved an undergraduate bioengineering program at the Faculty of Engineering. It will begin accepting students next year (2012). Bioengineering represents a mushrooming research and development field, and in the past eight years the Faculty has hired 15 new professors whose research focuses on bioengineering; they join many others whose work has carried them into this area. Engineering professors have also collaborated with other McGill researchers in the Departments of Biomedical Engineering (in the Faculty of Medicine) and Bioresource Engineering (in the Faculty of Agricultural and Environmental Sciences). 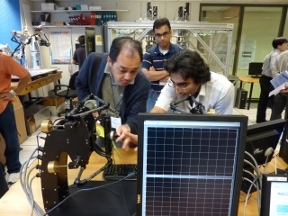 Among other things, these researchers have helped develop statistical computer vision techniques for image-guided neurosurgery (see photo above), designed prosthetic heart valves and intelligent drug delivery systems, investigated the growth and repair of cartilage, designed robots based on biological systems, created nano-biosensors to help detect environmental pollutants or hazardous substances, and developed environmentally friendly microbial biosurfactants for industrial use. Fastest growing discipline The new bioengineering program will build upon this expertise. In its first years it will concentrate on ensuring that students have a solid fundamental background in the field and include courses in such things as Cell Biology and Mammalian Physiology, Electrical Circuits for Bioengineers, Molecular, Cellular and Tissue Biomechanics, and “Biosystems and Control.” McGill Engineering joins a growing number of American and Canadian universities offering such programs. Bioengineers are in demand, and the U.S. Department of Labor recently predicted that bioengineering will be the next decade’s fastest growing engineering discipline. Graduates of the McGill program will find an especially vibrant professional culture in Quebec, where McGill is located, because of its thriving biotechnology, biopharmaceutical and medical device industries.